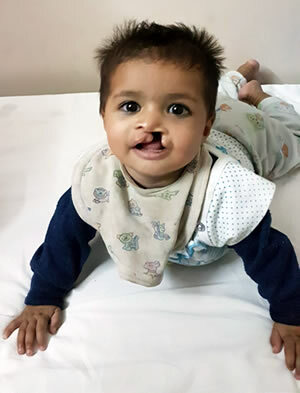 The cleft of the lips and palates may be associated with other anomalies of hands and feet, constriction rings, anomalies of heart, spine,face,neck,trachea,chin, etc. about 400 such combinations of deformities-syndromes are known, but they happen rarely. Pierre Robin Syndrome – The palate is cleft , chin is small-hypoplastic and small tongue falls back into the airway. Child finds it difficult to breath while sleeping supine. Such babies are best nursed in semiprone or prone position- face down, as then the tongue falls forward clearing the airway.